Classes begin Sept. 27 for Wexford University’s master’s degree in Applied Sport Psychology and registration is now available online. The unique online degree program trains graduates to work with athletes at all levels in training and competition. The Wexford Master of Arts Degree in Applied Sport Psychology is perfect for those in the fitness, nutrition, personal training, coaching or sports industry. Are you addicted to fitness-focused reality shows? The shows where they try to go faster, higher and bigger than the rest, outlasting their competition when it comes to mental and physical challenges? If so, you might be a perfect candidate for Wexford University’s online master of science degree in Applied Sport Psychology, which focuses on both mental training and sports applications. 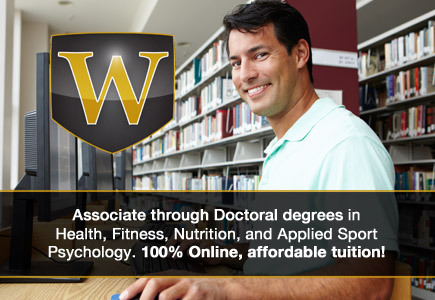 Registration for fall classes recently opened at http://wexford.edu/degree-programs/applied-sport-psychology-online-masters-degree/. Fall classes in the flexible, affordable and convenient degree program begin Sept. 27. Wexford University’s Applied Sports Psychology master’s degree can also lead into its doctoral program in the same field. Likewise, graduates can also use the program to update their skills and interests in health, fitness, sports and psychology and to work with youth and adults in a variety of health and wellness fields. Wexford University offers a variety of online wellness degrees from associate to doctoral level programs with ongoing registration, flexible self-paced study and the ability to pursue a degree in the growing field of Sport Psychology.